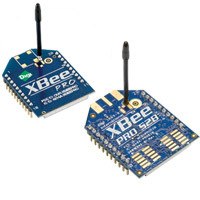 Digi International has launches an example section on their website to showcase what can be done with their XBee 805.15.4, ZigBee and WiFi Modules, as well as their IoT gateway. They provide examples to use different type of sensors, control lights, motors, and more. They show demos on the website and explain how each components can be linked together, hooked to computers and connected to the internet. The first four examples look good to get started, but the Light Switch XBee is the most interesting, and they describe 8 steps to show how to make it yourself. The XBee QuadCopter looks pretty good. If you have an interesting project using XBee modules that you have documented on the internet, they may be willing to link to your project. Visit Digi XBee Examples site for details.